Chris, our sailor who was sliced by Donna the mermaid, held in a military hospital and then escaped has been hiding out in Alaska. Which turns out to be pretty pointless, because Decker, our torn military scientist who is experimenting on mermaids but is kind of guilty about it finds him to basically find out what Chris knows and where Donna is. Since he knows nothing, including her location that means he can return home. But Ryn and Donna do return to shore - Donna following Ryn and really really not happy about it. Ryn thinks the humans can help them. Donna thinks humans are terribad awful creatures that can’t be trusted. She also rips off Ryn’s tracking necklace because that wasn’t a respectful thing for Ben to put on her anyway. So what is the problem? There’s no food in the ocean. All the fish are gone. This is why Maddie and Ben have been found very very deep ocean fish apparently dead of starvation. And they’re going to do this without some other government department - or government - noticing and getting Upset By This. I can see this not going well with ANYONE. 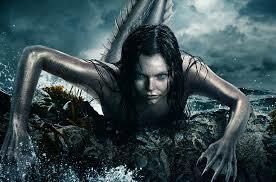 And aren’t the mermaids more likely to migrate out of US fishing waters? Doesn’t that make more sense for a fish-eating species than coming to land to be captured?